For families that want to grow their own blueberries, picking which variety and growing them doesn’t have to be hard. The secret to blueberry success, according to berry expert Amelie Brazelton Aust of Fall Creek Farm & Nursery, who’s been growing blueberries on her family farm since she was a child, is the Four Ps — planting, pruning, picking and protecting. The first secret to success is planting the right variety. 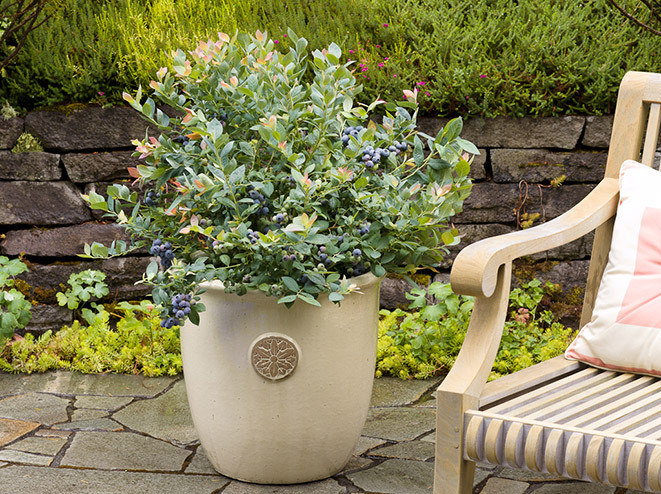 Compact blueberries, like those from the BrazelBerries Collection, are perfect for growing in patio pots, raised beds and directly in the garden. Once you choose a blueberry bush, it’s important to plant it in the right place. Blueberries need at least six hours of sun each day. Next, consider the soil. A simple soil test indicates acidity, which can easily be adjusted with amendments. Blueberries love acidic soils. A pH of 4.5-5.5 is ideal. Both soil kits and amendments are available at any local garden center. Aust recommends giving the plant’s roots plenty of growing room when planting in a container. “Plant them in pots 16 inches or more in diameter and water deeply and regularly to make sure all of the soil within the pot is moist to the point that water is dripping from the pot’s bottom drainage holes,” she says. Cutting beautiful branches off any plant can be daunting, but rewarding. Pruning gives the bush more space between its branches, allowing air to flow freely through the plant and helping to prevent disease. “It’s best to prune blueberries in late winter when the plants are still dormant,” says Aust, “but I’ve pruned mine in the spring before flowering, and they’ve done great.” Remove all the stems that are damaged, old or dead. Take out up to a quarter or even a third of the bush, then trim it up to a neat and tidy look. Aust recommends a second fertilizer application in late spring to give the plants an extra burst of energy for fruit production. If you’re not sure which fertilizer to use, ask an expert at your local garden center. With planting and pruning in the bag, the next step — picking — is the pay off. Be sure to watch your berries carefully and pick them before the birds do. 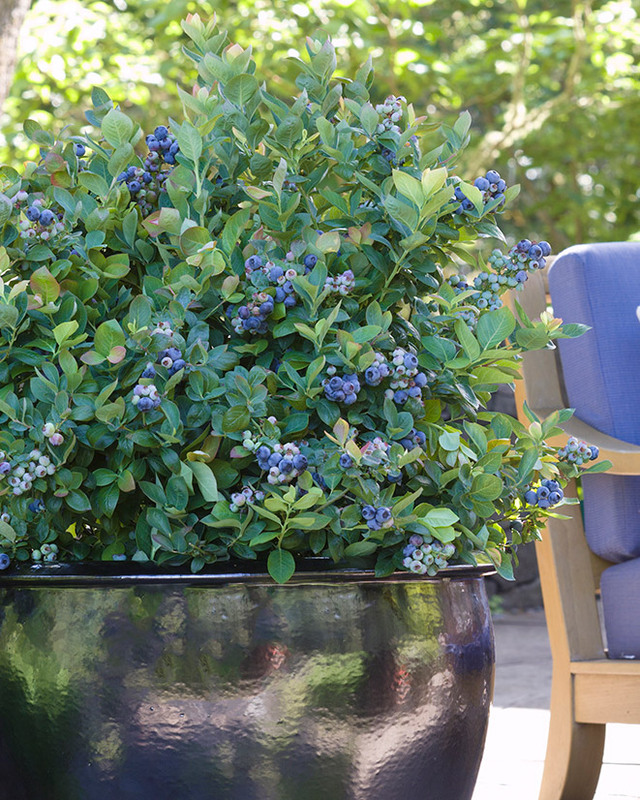 A little protection ensures your blueberry bush will thrive for another bountiful season. If birds are a problem, cover with bird netting in the spring to keep critters away. 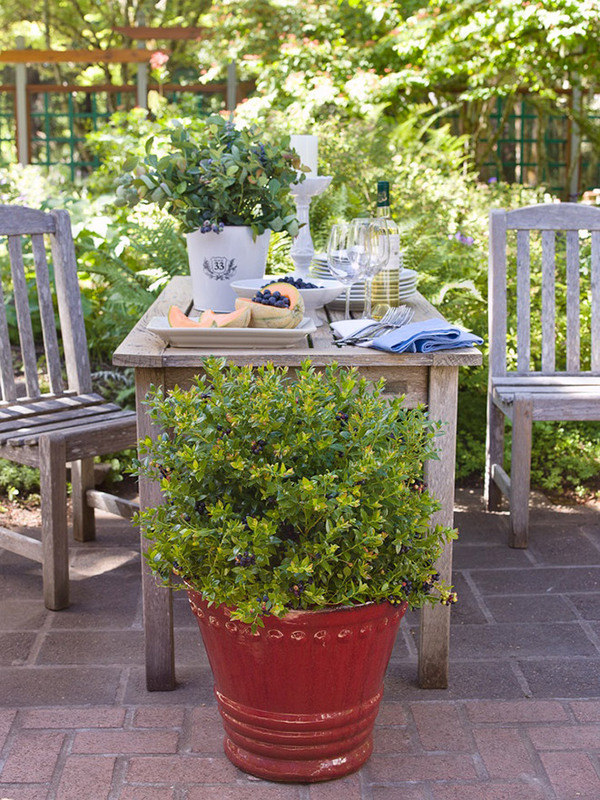 Birds are less likely to eat the fruit when the plants are in containers on the patio. Winter weather poses the biggest risk to berry bushes, so be sure to protect roots. Spring’s sudden cold snaps endanger emerging growth, as well. Be sure to cover blueberry bushes with burlap or blankets when the forecast calls for frost once buds and flowers are emerging. Following these tips will ensure success with your blueberries season after season.